Laura Hergane was born in Timişoara, Romania where she grew up, studied and went to college. She earned a Bachelor of Arts in Philology at West University of Timişoara. At age 30, she . . . won the lottery. The Visa Lottery, and she relocated to Dallas. In other words, she wasn't born in Texas, but she moved there as fast as she could (Texan saying). She landed in the financial planning world, then she found a new passion, coaching. As she was helping others get empowered, she realized that there was "something" undefined, like a calling that she needed to pay attention to. When the muses began to keep her up at night, she knew that "something" was writing. Even though she first completed a memoir, she chose The Room Above to be her debut novel. She is working on her next book (literary fiction), and cannot wait to materialize the other writing projects she has in mind (children's, cooking, self-help and more fiction). The Room Above by author Laura Hergane is a work of literary fiction. Although a shortish read, it has the kind of gravity to it that feels much longer. The words read off the page like poetic prose and throughout most of the book have an almost hypnotic aura about them. One of the lines that was particularly poetic: “Poor man rids of his sorrow as he drives.” It’s a very visual image and one that sits with you after you’ve read it. In the beginning, The Room Above was delightfully engaging, and it really pulled me in hook, line, and sinker. This is the story of Dara, a young eighteen-year-old girl who ventures into the unknown with only her own strategies and a few items to accompany her, away from a land that attempts to keep her oppressed. Who would not find that exciting? The middle of the book was not as engaging for me. It switched from its original point of view and while it was interesting, I couldn’t connect again with the original enthusiasm I had for the beginning of the story. That being said, it is still a very good read and many people across many different ages would get something quite wonderful out of this book. 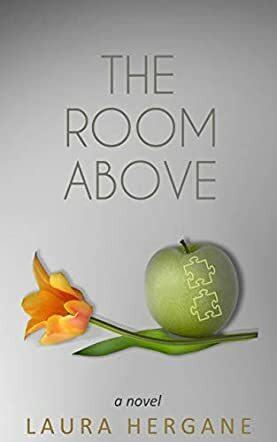 The Room Above does have a handful of words that you may need to break out Google Search for, but it is understandable in much of its content. The ending does have some of the same kind of excitement that the story began with. It has a way of coming full circle and creates a well-crafted ending that will surprise the reader and put them off balance, and any book that can surprise me is one that is worth reading. At nearly eighteen years of age, Dara cannot pour herself into the mold expected by her parents nor can she succumb to the arrogance of her boyfriend, Dan. She needs to leave. To go where she is not known. Departing on foot in the wee hours of the morning, Dara begins her walk from Timisoara, Romania and heads to the train station, a destination that does not materialize. Instead Dara puts into motion her plan to escape to the Americas, acquire a new identity, and begin anew. Written by Laura Hergane, The Room Above is divided into two major sections of narrative. From the first line of The Room Above, the reader is entangled in Dara’ story of change. “There is something about taking a bath in cold water. It clears my mind. It gives me power. It gives me freedom” begins each chapter until she places her feet on foreign soil. When the second part of the story begins, be ready to start asking questions. It is as if Hergane has incorporated two entirely separate novels into one. However, even with a keen eye for detail, a second reading may be necessary to piece together the mystery of the two halves. While in Romania, Dara’s actions are common to the setting. Upon reaching her destination, detail becomes sketchy. Upon reflection, the purpose of the tale begins to take shape, but readers need to focus to retain a grasp on the story, one which is open to interpretation. The Room Above by Laura Hergane is a novel of literary fiction set in Romania in 1989. The main protagonist of the book is an 18-year-old girl called Dara who lives with her parents and younger brother in the family's apartment. She is a philology student and, like her father, has a passion for words. Her boyfriend, a slightly older man called Dan, is part of the establishment. Their relationship is not what it should be and becomes increasingly strained. These are dark days and the Communist bloc in Eastern Europe is about to collapse. Dara has a plan to escape. Will she make it? What do we make of the subsequent events that unfold? This book can be read as an extended metaphor set in a historical context and is meant to create a space open to interpretation. The Room Above is an unusual novel and those who are looking for a challenging read will undoubtedly enjoy this book. Set against the political landscape of the time, it is written from the perspective of a young girl who, initially, appears to suffer from a personal obsession. However, it becomes clear that there is far more to her situation than the reader is first led to believe. As the book progresses, events become rather surreal and otherworldly. I was intrigued by Laura Hergane's beguiling use of a repetitive phrase which provided a thread throughout. The concluding chapters, where all is revealed, provided a satisfying climax to the enigma surrounding the room itself. Expect the unexpected with this book and open your mind to all possibilities.